VGADVI Broadcaster captures an HD video source such as a computer monitor, RADAR display or ultrasound monitor as well as an SD video source such as a camera feed. VGADVI Broadcaster then streams these inputs as two synchronized time-stamped streams or one picture-in-picture stream. The streams can be viewed remotely in a multitude of ways, including through web browsers, media players, or mobile devices. A recording of the streams can also be made. VGADVI Broadcaster is easy to setup and use, and works straight out of the box. It does not require the use of a computer or any additional equipment - simply power it on to start recording. VGADVI Broadcaster captures an HD video source (up to 1920x1200) channel from a VGA/DVI/HDMI1 display or camera, in parallel with an analog S-Video/Composite (PAL, NTSC) SD video source channel and a stereo/mono audio source. VGADVI Broadcaster streams the input channels as a single stream or two independent streams up to 30 FPS. Standard browsers and media players view the stream(s) via a URL over choice of: HTTP, RTP over RTSP, UDP, HTTP Administrators can custom brand the output stream layout, picture with picture arrangement, time stamping, copyright, and other branding. 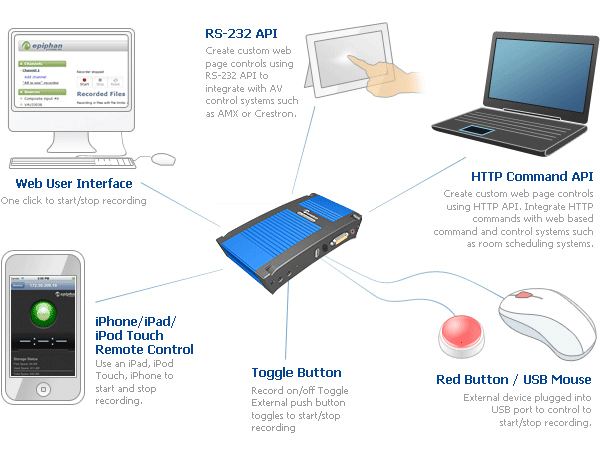 VGADVI Broadcaster records the input channel streams to its 8GB internal storage, network storage, internal FTP server, external FTP site and/or local USB storage key. Media files can be viewed by standard media players, browsers and processed with standard multi media editing tools. VGADVI Broadcaster streams can be viewed through virtually any web browser. Simply enter the IP address of the VGADVI Broadcaster device to view the live stream. The live stream can be viewed by almost all media players that support live streams, including Windows Media Player, QuickTime, VLC, and others. VGADVI Broadcaster has support for an MJPEG video-only stream, viewable on most mobile devices including Apple iPhone and iPad without the need for additional software. VGADVI Broadcaster can be configured to automatically copy recordings to a network storage location using a choice of FTP, CIFS or RSYNC. This feature facilitates integration with content management and publication systems. VGADVI Broadcaster will automatically copy the most recent recordings to a USB Storage Key. This is a great feature if you want to instantly provide a copy of the presentation to the presenter without requiring network connectivity. VGADVI Broadcaster has a built in FTP server for integration with content management systems that simply need to connect via FTP to ingest the recorded content. VGADVI Broadcaster is a compact portable desktop recording solution that is 7.95"x4.13"x1.38" (202x105x35mm) in size. 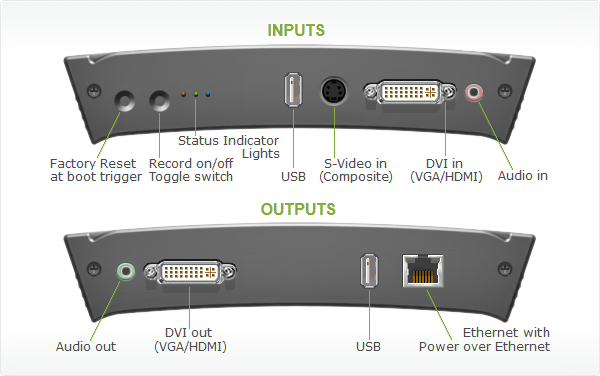 The buttons and connector interfaces are shown below. Multi-Source Picture with Picture Video Matrix / Multiplexing Features VGADVI Broadcaster can be configured to synchronize and record video sources as a single video channel or maintain the two video sources as a multi-track video channel. CDNs, or Content Delivery Networks, are scalable services that allow the user to quickly and easily distribute content over the web to a wide variety of devices and in different formats. VGADVI Broadcaster provides multiple ways to share captured video with the world and has out-of-the-box support for CDN services such as StreamZilla and StreamGuys. Epiphan Systems also provides its own free-of-charge CDN service - Epiphan.TV, on a trial basis to each VGADVI Broadcaster user. VGADVI Broadcaster has a web-based file manager to view recorded files as shown below. Each file has a name and start time, end time and duration fields. Files are grouped by date and segmented by contiguous recording timelines. You can change file names, upload one, multiple or all files, delete one, multiple of all files. Web, FTP, USB Key, automatic FTP upload, automatic RSYNC/CIFS synhronization.